Anyway it's fine about the resolution. Changing my monitor's desktop resolution works fine it just screws up all my desktop icons, resets the default window sizes, etc. I just noticed the "resolution_list" line in the error.log and figured there might be a way to set a resolution in the .ini file. For people having problems with the diagonal input not working with onimusha search google for a file called "DirectInputFPSFix.zip" it's a re-compiled dinput8.dll that was originally made for FEAR and a few other games that used Monolith's engine. There's a readme included with more details. Once you've extracted the dinput8.dll, place it in Onimusha's folder, setup a config in JoyToKey, then make sure you have XInput set to Enable in Piexoto's launcher(If you don't the game will crash until either you enble the option or delete the dinput8.dll file). I should also note that although this worked for me on my PC, it did not work on my brothers.... Still it's worth a shot, I think. Last edited by curseofnight on 2018-5-16 @ 00:15, edited 2 times in total. Honestly, it's mainly Onimusha that experience lag with. As someone mentioned before, it doesn't seem to be well optimized. Onimusha 3 is kinda the same for me. I have to play in 800x600 to get a consistent frame rate. Other (older)PC games are fine. Like in Oblivion I can play in 1600x900 with Qarl's texture pack plus 50+ mods and it's very smooth. About the drivers; I'm using the msi drivers from the disc that came with the card. I also uninstalled the drivers for the onboard intel video beforehand. I suppose I could get some offical amd drivers from their website. The 6450 isn't really a great card to start with though. I only got cuz it was on sale. Edit: It seems I have the correct amd drivers already. It's kool though, like I mentioned above it's not a problem playing in 800x600. I grew up playing quake in 320x200 so I don't mind. Is there any chance to fix the FMV with scale without crashing in Resident Evil 1? curseofnight wrote: Honestly, it's mainly Onimusha that experience lag with. As someone mentioned before, it doesn't seem to be well optimized. Onimusha 3 is kinda the same for me. I have to play in 800x600 to get a consistent frame rate. Other (older)PC games are fine. Like in Oblivion I can play in 1600x900 with Qarl's texture pack plus 50+ mods and it's very smooth. Alkimical wrote: Is there any chance to fix the FMV with scale without crashing in Resident Evil 1? Mmm, so; I wonder if I'm only one with those crashes, or there are some few cases. Maybe it can be caused by my PC Setup, drivers or some program running in the background. Trying to play TR2+ios textures fix with your patch right now and it looks pretty good except, how do i say that - texture shimmering? They like too sharp, pixel crawling, maybe lack of mipmapping? It can be somewhat mitigated by downsampling from 4k res through Nvidia DSR, but HUD will be very small..I know about Force native resolution and Allow Dynamic Super Resolution, but enabling them don't set resolution to 4k..
KainXVIII wrote: Trying to play TR2+ios textures fix with your patch right now and it looks pretty good except, how do i say that - texture shimmering? They like too sharp, pixel crawling, maybe lack of mipmapping? It can be somewhat mitigated by downsampling from 4k res through Nvidia DSR, but HUD will be very small..I know about Force native resolution and Allow Dynamic Super Resolution, but enabling them don't set resolution to 4k.. Doesn't anisotropic filter helps with the textures ? SOOOOO many bugs! Sometimes i regret ever releasing this. Piexoto, thank you for this amazing work. I can't believe TR2 is running this great on my pc. I haven't seen this answered, but have a question about looping audio. 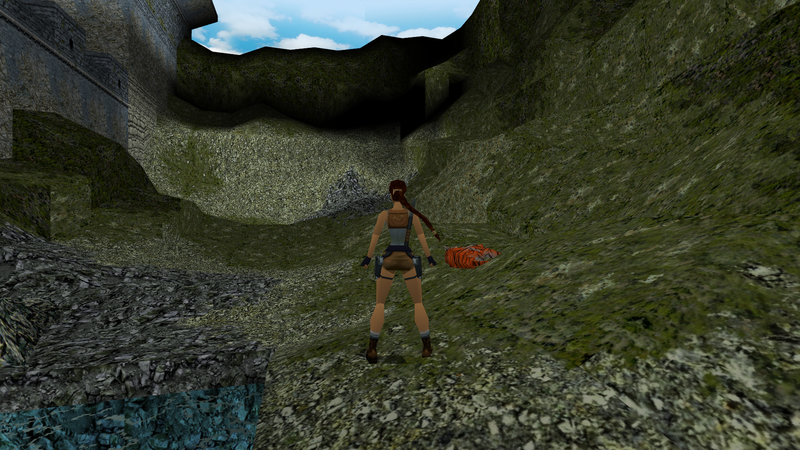 Just as a test, I started up TR2 through your utility and went to lara's home. The voice audio just keeps looping. I can trigger a new audio response by moving Lara and then that audio keeps looping. Thoughts? kortex wrote: Piexoto, thank you for this amazing work. I can't believe TR2 is running this great on my pc. I haven't seen this answered, but have a question about looping audio. Just as a test, I started up TR2 through your utility and went to lara's home. The voice audio just keeps looping. I can trigger a new audio response by moving Lara and then that audio keeps looping. Thoughts? Thank you! I'm actually not using MCI emulation sir! I'm using the script and help.exe from the link on the first page of this thread. I suppose I should add in that I'm using the GOG version of the game. I discovered something weird about the crashing in RE1 with FMV scale. If I disable Xinput in your panel or turn off my Xbox controller, the game doesn't crash at 2.25 FMV Scale. Alkimical wrote: I discovered something weird about the crashing in RE1 with FMV scale.